The government blames al-Qaida for the killing of several senior military and intelligence officials this year mainly by gunmen on motorbikes. 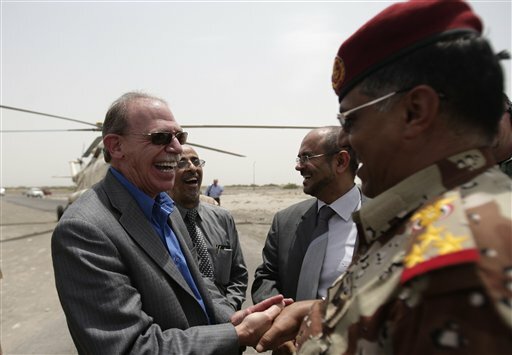 SANAA, Yemen — Al-Qaida’s branch in Yemen has offered to pay tens of thousands of dollars to anyone who kills the U.S. ambassador in Sanaa or an American soldier in the country. An audio produced by the group’s media arm, the al-Malahem Foundation, and posted on militant websites Saturday said it offered three kilograms of gold worth $160,000 for killing the ambassador, Gerald Feierstein. It said the offer is valid for six months. The bounties were set to “inspire and encourage our Muslim nation for jihad,” the statement said. The U.S. Embassy in Sanaa did not respond to an Associated Press phone call asking for comment. Washington considers al-Qaida in Yemen to be the group’s most dangerous branch. The group overran entire towns and villages last year by taking advantage of a security lapse during nationwide protests that eventually ousted the country’s longtime ruler. Backed by the U.S. military experts based at a southern air base, Yemen’s army was able to regain control of the southern region, but al-Qaida militants continue to launch deadly attacks on security forces that have killed hundreds. In the capital, Sanaa, security officials said two gunmen on a motorbike shot and killed two intelligence officers early Sunday as they were leaving a downtown security facility. The officials, who spoke on condition of anonymity according to regulations, said all intelligence and security officers have been instructed to take precautionary measures outside working hours. The officials said security authorities in Sanaa have launched a campaign against motorcyclists suspected of involvement in these attacks or other crimes, arresting about 200 for questioning for violations, including driving motorcycles without license plates.